The Periodic Table of Elements lists the 118 chemical elements that make up everything in our world. Some you're familiar with--Hydrogen, Oxygen, Nitrogen, etc. Others maybe less so--Vanadium, Germanium and Yttrium. According to the American Chemical Society, 44 of those 118 elements might disappear by century's end. 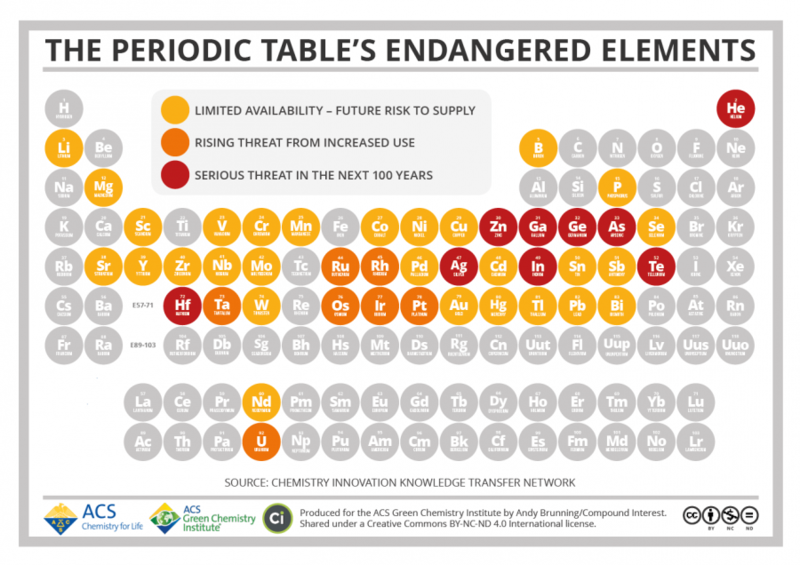 Enter the Periodic Table of Endangered Elements (shown above). The most endangered ones, highlighted in red, are Zinc, Gallium, Germanium, Arsenic (is this a good or very bad thing? ), Silver, Indium, Tellurium, and Hafnium. Made available under a Creative Commons license, the Periodic Table of Endangered Elements can be viewed in a larger format here. Hmm… Do you really need to resort to clickbaiting headlines? Don’t forget Helium. It is considered in short supply, to the point that countries have been stockpiling it for decades. At what point will recycling indium from old LCD panels become feasible?